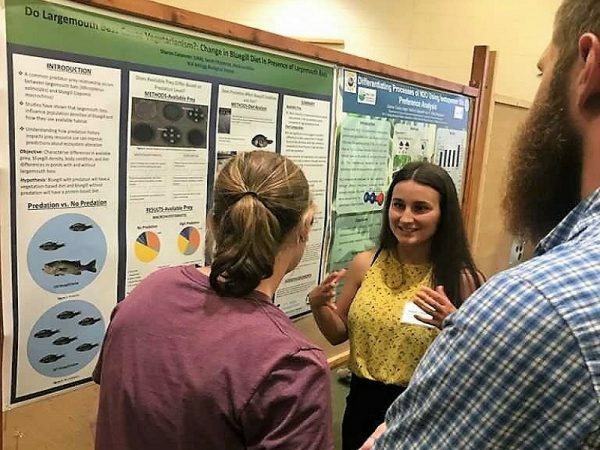 KBS 2018 undergraduate summer researcher Sharon Carpenter is a junior at Michigan State University. 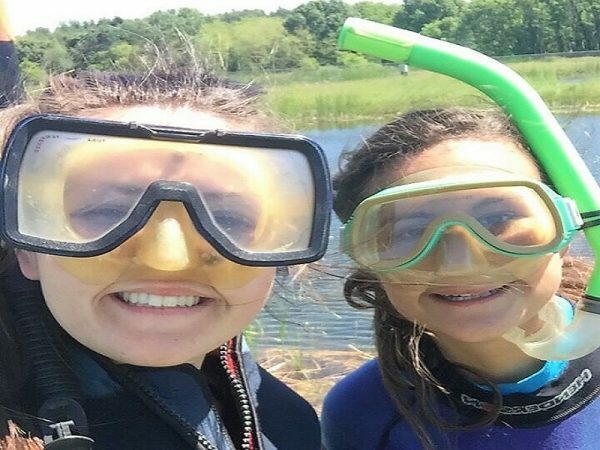 She wrote about her Undergraduate Research Assistant project working with mentor Dr. Sarah Fitzpatrick. Carpenter was funded by a URA award from the Kellogg Biological Station. “Do you remember when you fell into the pond with your waders on?” says Madison Miller, a lab technician in Sarah Fitzpatrick’s lab. As we laughed with tears in our eyes, I knew I found my story for this blog post. Yes, you might be reading and wondering what happened, but first let me tell you a little more about who I am and why I decided to work as an Undergraduate Research Assistant (URA)at the W.K. Kellogg Biological Station (KBS). Currently, I am going into my junior year at Michigan State University studying Fisheries and Wildlife with a concentration in Fisheries Biology and Management. Being a member of the Dow STEM Scholars Program, I was able to get connected to opportunities at KBS. The Dow STEM Scholars Program is targeted at assisting students who are pursuing a STEM (science, technology, engineering, mathematics) major. At KBS I’ve had research experiences that range from looking at microbes in a microscope, to sampling bluegill from man-made ponds. After just my first year at KBS I fell in love with the people, environment and of course fishing Gull Lake. Last summer I worked at the pond lab that has 18 man-made ponds. Two of these ponds contain fish – one with largemouth bass and bluegill, and one with just bluegill. Largemouth bass eat bluegill and pressure them to stay in shallow water where there is more vegetation for them to stay hidden. My research focused on whether the presence of these predators causes changes in diet for bluegill. To test this, I came up with some methods that left me with waders full of water. How do you adjust to the unexpected? To me, that is the most interesting learning experience in research. You cannot prepare for the unexpected, and once it happens, it is left in the past. Madison and I worked closely over the summer and helped each other on our projects. We both needed to collect bluegill for our studies, and decided to use seine net. As I got the net to the edge of the pond, I slipped and fell into the water! It was then I learned you can spend hours on end coming up with what you think are the “perfect” methods and the “perfect” experiment, but things do go wrong. When I fell into the water and walked around the whole pond with my waders filled, I couldn’t help but laugh. I knew that I never wanted to do that again, but it could happen, and that is okay. Now I can try different techniques to avoid mistakes next time. My research had a set of methods that I was excited about. I compared the diets of bluegill with predators, and no predators, by dissecting and measuring the mass of the stomach content of each fish. The mass part did not work out because the mass of the stomach content was too small to process. I was able to use the resources around me, including my mentor Dr. Sarah Fitzpatrick, Madison, and others at KBS to find another way to quantify the stomach content. After I adjusted from the unexpected problem in my methods, I still discovered some interesting and surprising results. I found that bluegill diets differed in the two environments, and that predators actually improved the diet of sunfish by keeping their populations sizes small. When there were fewer bluegill there was more high-quality food left for the survivors.